From the epic that began it all - to the blockbuster event to end all blockbuster events! For Thanos, the Infinity Gauntlet is the ultimate prize. With it comes omnipotence: absolute control of time, space, power, reality, the mind and the soul. On the edge of Armageddon and led by the mysterious Adam Warlock, Earth's super heroes join in a desperate attempt to thwart one nihilistic god's insane plunge into galactic self-destruction. Years later, Thanos makes a world-shattering return, seeking to claim Earth while the Avengers are caught in a war in deep space! Galactic empires will fall as his crazed plans come to fruition! From the cosmic minds of Jim Starlin and Jonathan Hickman come the bookend chapters of the Mad Titan's quest for infinity! Marvel Comics, in typical tactics to drive up sales, will be releasing four covers for the upcoming Infinity by Starlin and Hickman Omnibus (available April 2019). 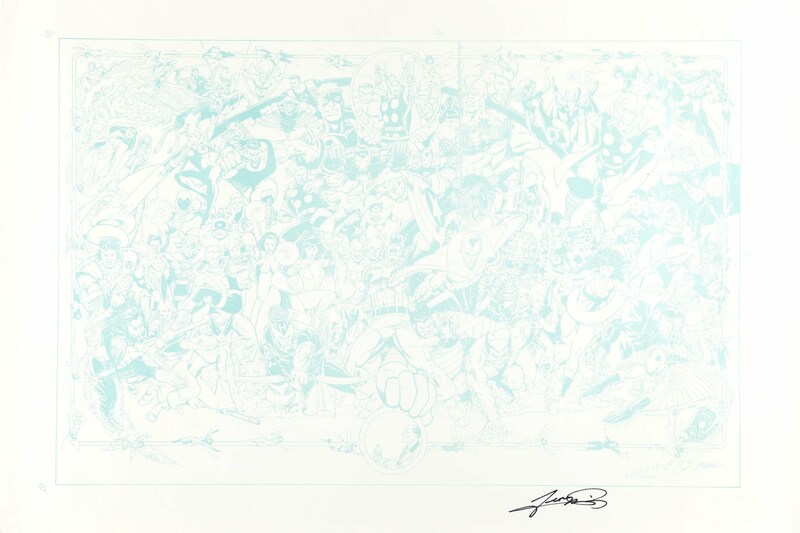 Here is the George Perez variant cover. The artwork is a minimalist version of the classic Infinity Gauntlet #1 cover.